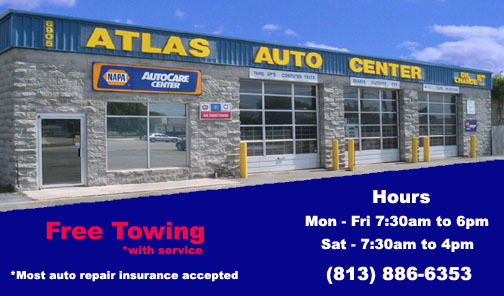 Master Auto Technicians and owners of Atlas Auto Center in Tampa, Reza and Ali offer you the personal care and attention you and your car deserve. With over 30 yrs combined experience in complete auto care, your car will be inspected and fully diagnosed. All repairs and parts are estimated and discussed with you prior to the start of work. While repairs are being performed you can relax in the climate controlled comfort of the customer waiting area while enjoying free Fios Highspeed Wi-fi access, cable TV and fresh brewed coffee, or receive a ride where you need to go and we'll come pick you up when your car is done. On completion of service your car will be returned to you repaired, clean and with a 30 day warranty on labor and 1 yr on parts. Since the Master Technician that repairs your car is also the owner, from a tire change to an engine change, you can be assured that they care about you, your car, and the quality of your experience. Stop by or make an appointment to see why everyone rates Atlas Auto Center in Tampa 5 stars.